Sometimes known as the "freshwater shark", the pike is the largest predatory fish found naturally in the British Isles. With eyes positioned at the front of its head the pike can stare right back at you! The back of the pike is covered in a marbled effect pattern of grey, green and yellow. It is superbly camouflaged as it lurks in reeds ready to ambush its prey. The pike's upper and lower jaws have teeth and to ensure a vice like grip on its food, the pike also has teeth on the roof of its mouth and on its tongue. The fish is found in all kinds of freshwater. Rivers, lakes, reservoirs, gravel pits and canals will have pike. There is even a story of a monster pike caught in a moat surrounding an ancient castle and in its stomach was a suit of armour! Pike can grow to be large creatures and specimens of more than 10kg are common. Young fish are called "jack pike". For a strong fish, use strong tackle. Choose a purpose built pike rod and a fixed-spool reel. Pick a large reel that can hold lots of heavy duty line. When a pike is hooked it will fight for its freedom and strip line from the reel. Line of 20lbs breaking strain is suitable. Some anglers use wire traces on the line for extra reliability against snapping. Floats used for pike fishing are large and heavy weights are required to balance them in the water. Extra strong hooks of size 4 to 8 are recommended. Ask the people in the tackle shop for advice. They are usually anglers and will offer help and guidance. The natural diet of pike includes fish, small mammals, young wildfowl and worms. Being a predator the pike relies on its senses to hunt out prey. Eyes at the front of its head help to focus on its victim and calculate the distance of attack. It has an acute sense of smell for detecting decaying food in the water. The pike is sensitive to vibrations that may indicate injured or vulnerable fish. Using dead bait is a popular method for catching pike. Fry such as minnow, bleak and small roach are caught or trapped and then placed on the hook. Slices of mackerel or just their tails have proved to be successful bait. Sprats, sardines, chunks of eel and bunches of long worms are all worth a try. The use of lures is popular with pike anglers. Lures are made from wood, plastic or metal and are always brightly coloured. Visually they only partially resemble fish or small mammals. However, when lures are retrieved they spin and vibrate in the water and this action entices the pike to attack. Being quite heavy, lures can be cast long distance and therefore cover more fishing areas. The pike is master of ambush. It hides among submerged tree roots. It lurks in reeds and in the shadows of overhanging vegetation. Casting a dead bait or lure into these kind of habitats will produce pike. In rivers choose a place where the current is slower and in reservoirs try the natural stream bed because its flow attracts shoals of fry. 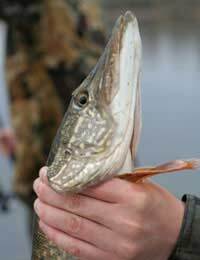 When unhooking a pike it makes sense to wear a thick glove for protection against sharp teeth and hooks.